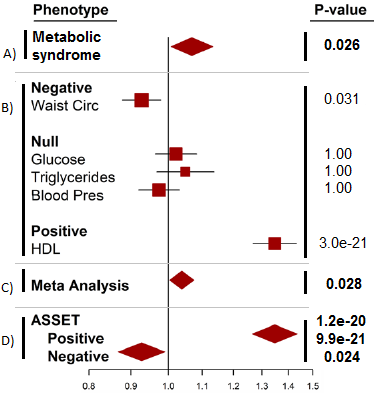 Association of rs247616 G allele (in CETP) with metabolic syndrome or its components, as assessed by different methods: A) association with metabolic syndrome overall (yes/no); B) association with each metabolic syndrome component individually; C) association with metabolic syndrome, using standard meta-analysis across the individual components; and D) association with metabolic syndrome using ASSET, overall and separated into positive and negative components. As ASSET takes the opposite directions of effect into account, a lower overall p-value of 1.2e-20 is observed. The other methods provide p-values for the overall association that are attenuated (p=0.026 and p=0.028) due to the null effects of the other components and the effects in opposite directions. Metabolic syndrome is a disorder characterized by having three or more of several cardiometabolic risk factors, including abnormal blood lipid levels, central obesity, high blood glucose levels, and high blood pressure. Importantly, any particular case of metabolic syndrome may be comprised of different combinations of these components. This variability in composition has made it difficult to determine the genetic underpinnings of the overall disorder, since genetic variants may be associated with individual components in different ways. A new meta-analysis method called ASSET, however, provides a more powerful approach for investigating genetic variants with pleiotropic effects. In a recent report in Circulation: Cardiovascular Genetics, Drs. Cara Carty and Charles Kooperberg and colleagues in the Public Health Sciences Division utilized this approach to identify several variants associated with metabolic syndrome, one of which may be specific to African American ancestry. One of the primary challenges in studying the genetic architecture of metabolic syndrome is its multi-component definition. While identifying whether a genetic variant is associated with any particular individual component is fairly straightforward, identifying how a genetic variant contributes to metabolic syndrome overall is more complicated. Said senior author Dr. Kooperberg, "typically in genetic association studies, when we examine multiple traits, those are combined with a standard meta-analysis, which assumes that the genetic variant affects each trait in the same way." In the case of metabolic syndrome, however, a variant may be associated with one or more components but not others (such as being associated with higher blood glucose and triglyceride levels but not with other components), or may be associated with different components in opposing directions (such as with higher HDL levels but smaller waist circumference). As such, combining these multiple associations across components using traditional methods may not accurately capture the overall effect of a given variant (see figure). Instead, said lead author Dr. Carty, "we applied a new method, ASSET (ASsociation analysis of subSETs), that efficiently addresses some of the analytical issues that may arise in the investigation of pleiotropy." This method detects positive and negative associations for components separately, and then combines these tests while accounting for the correlations among the components. Said Kooperberg, "this method, developed by our colleagues Sam Bhattacharjee and Nilanjan Chatterjee at the National Cancer Institute, allows those traits to be divided into three groups (positive, negative, and null associations with a genetic variant) while maintaining the proper characteristics of statistical testing (especially the false positive rate)." The authors used the ASSET approach to test nearly 200,000 genetic variants on the Metabochip, a customized genotyping array targeting genomic regions associated with metabolic traits, for an association with metabolic syndrome or one of its components. These variants were first tested in 15,000 African Americans from the Population Architecture using Genomics and Epidemiology (PAGE) study. Said Kooperberg, "this metabochip data and a novel use of the ASSET methodology allowed us to identify 27 single nucleotide polymorphisms that were associated with some of the components of metabolic syndrome." These 27 variants were located in 5 genetic regions previously associated with glucose (TCF7L2) or lipid levels (LPL, APOA5, CETP, and APOC1/APOE/TOMM40). Many of these genetic variants showed pleiotropic relationships in opposing directions for different components of metabolic syndrome. One associated variant appeared to be an African specific variant (rs12721054 in APOC1), as it is found in very low frequency in other populations. This and another variant, rs10096633 in LPL, demonstrated pleiotropic relationships with at least three metabolic syndrome components. Of these 27 initial findings, 17 variants in three loci (LPL, APOA5, and CETP) also showed a statistically significant association with metabolic syndrome when tested in an independent replication population of roughly 5000 Hispanics. Overall, these results highlight the usefulness of the ASSET method for increasing statistical power to detect associations in cases where genetic variants may have pleiotropic relationships. Said lead author Dr. Carty, "investigation of pleiotropy is an exciting area of research, particularly due to the wealth of genetic information now available to researchers and the potential clinical applications of such gene targets." The authors hope that identifying these pleiotropic associations could eventually be clinically important, helping to elucidate potential gene targets for medications and contribute to risk profiling. Other PHS investigators contributing to this project were Drs. Christopher Carlson and Ulrike Peters, as well as Mr. Jeffrey Haessler. Carty CL, Bhattacharjee S, Haessler J, Cheng I, Hindorff LA, Aroda V, Carlson CS, Hsu CN, Wilkens L, Liu S, Selvin E, Jackson R, North KE, Peters U, Pankow JS, Chatterjee N, Kooperberg C. 2014. Analysis of metabolic syndrome components in >15 000 African Americans identifies pleiotropic variants: results from the Population Architecture using Genomics and Epidemiology study. Circ Cardiovasc Genet 7(4):505-13. doi: 10.1161/CIRCGENETICS.113.000386. Epub 2014 Jul 14.